I remember years ago I saw advertizements for this product and I knew there was no way it could work. 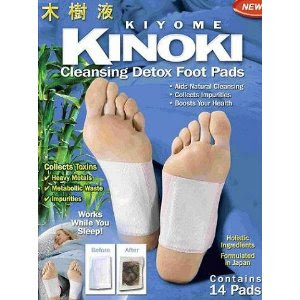 The goal of the Kinoki (notice the Japanese name implying ancient knowledge, that they even mention in the commercial) Detox Foot Pads is to remove toxins and heavy metals from the bottom of your feet all during your sleep. This sounds great right? Watch the commercial! Notice the information given in the video, they remove everything from your body: from toxins, heavy metals, and parasites, to cellulite all thru your feet! They even show a dirty used pad, granted I could get the same effect from a piece of duct tape. In the commercial they site the ancient concept of Japanese reflexology which is just a fancy theory on how to massage your feet to revitalize your energy. The question is do they work, it seems clear that they do not. The last straw for me during the commercial that made me lose any hope at all in the product was during one of the testimonials where the man comments on how the FOOT PAD removed asbestos from his body. Wait? That is not physically possible! You can breathe in asbestos and it causes cancer because it stays in your LUNGS, how can it get through your body and out your FEET? So from that one statement out of many absurdities I conclude that this product is a bunch of pseudoscience mumbo-jumbo. I like your post, I remember these commercials from a few years ago and though the same thing. I like how you added the science of how asbestos cannot escape through your feet. I am assuming you are a biology major or something similar because it taught me something that I did not know. Thank you for confirming my suspicions on this topic. I remember these commercials and my mom believed them. She believed that toxins and such could be taken out of your body through your feet. She told me once that when she had a fever her mother put an onion under the covers by her feet. The next day she felt better (yes her feet did stink...haha) and the onion was black. She told me that the onion drew out what ever was in her body and thus turned the onion black. Beleive it or not at the time I actually believed her. When your feet become intoxicated, you feel malaise, weakness, headache and your general health deteriorates. So we are here with some easy method of toxin removal from feet by easy home foot baths or foot soaks. Visit our site to know all this simple methods to treat your feet effectively.